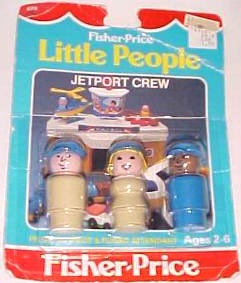 Description: This is a set of 3 Original Little People jetport/airport crew figures. These figures can be played with alone, or used as added accessories to jetport/airport related sets, such as the #182 Jetliner, or the #933 Jetport. This set features two exclusive figures, 1984-1988's tan body pilot and stewardess. They were replaced in 1989 with more common figures. AHPP - Blue African-American male pilot with a smiling face, wearing a dark blue cap with a "M" shape imprinted above the bill. EBPP - Tan body male pilot with a smiling face, and wearing a blue cap with a "M" shape imprint above the bill. GRPP - Tan body stewardess with a smiling face, and a blonde bob with bangs under a blue cap. Her cap does not have a bill, bit it has a "M" shape imprinted in the front. BUPP - Green body male pilot with a smiling face, wearing a green cap with a "M" shape above the bill. 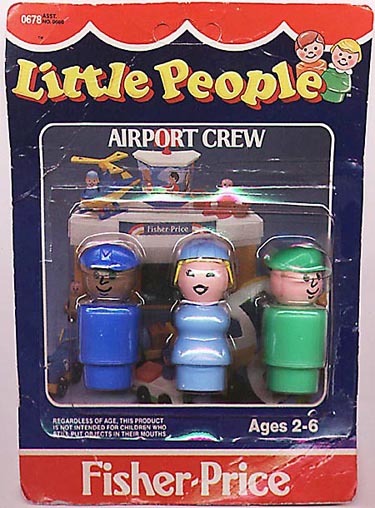 FDPP - Light blue body stewardess with blonde bob hair under a light blue cap. Her cap does not have a bill, bit it has a "M" shape imprinted in the front.